The MTV Video Music Awards bring the hottest names in music to the city Monday. The city is getting ready to host yet another memorable MTV Video Music Awards. 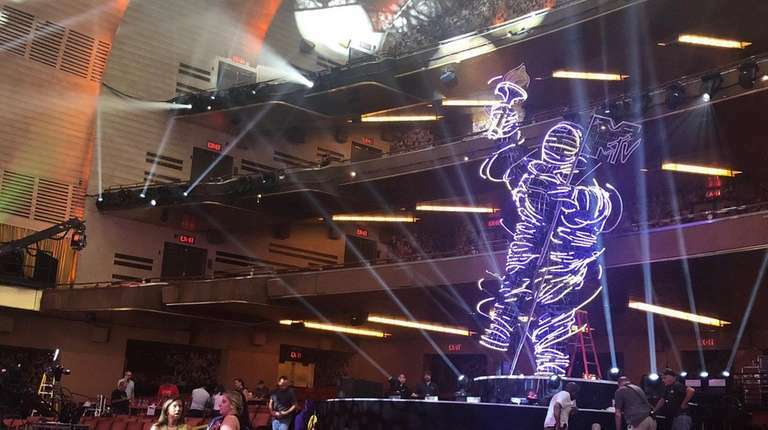 “New York always brings the energy,” Bruce Gillmer, executive producer of the VMAs, said while standing onstage at Radio City Music Hall Friday morning. Behind him, dozens of set and production crew members are putting the final touches on a “massive” stage built in celebration of the return of the annual award show to its home base. More than 1,200 seats have been removed from the historic Sixth Avenue music hall to transform the venue that houses the city’s annual “Christmas Spectacular” and frequently hosts today’s most popular touring bands. Front-row seats are replaced with a rounded stage that extends nearly halfway to the first mezzanine; a larger-than-life glowing “moon person” statue stands tall in the audience, illuminated by yellow and purple spotlights. The extended stage has an open seating area in its center, where about 100 seats are reserved for the night’s hottest celebrities and their guests. 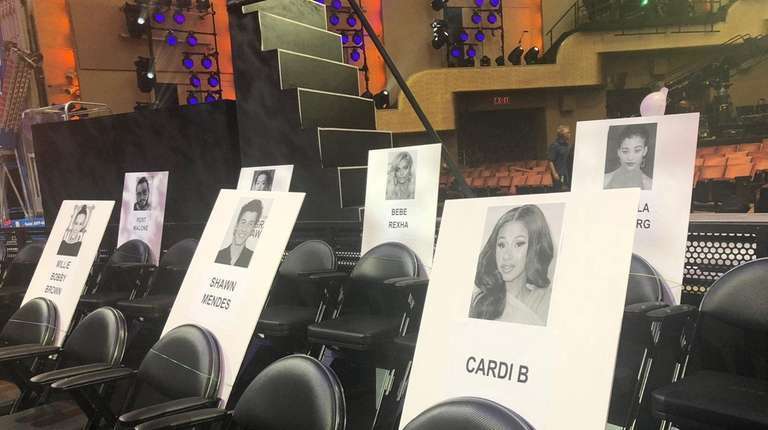 Honored New York City artists like Cardi B, who’s up for 10 awards and Video Vanguard-recipient Jennifer Lopez have the front-row on lockdown, while Kylie Jenner, Liam Payne, Blake Lively and Lenny Kravitz are scattered behind them. Cushioned black folding chairs have been rolled in for these elite guests -- though the comfort level is on par with the venue’s plush red seats -- and personal speakers are tucked away for them underneath. Preparation to host the biggest names in music began seven months ago, Gillmer said, from designing early stage concepts to figuring out how to make the New York City event unique. Airing Monday night, mere days from the passing of the “Queen of Soul,” Aretha Franklin, the ceremony will also honor the artist and “pay tribute to her monumental legacy,” an MTV representative said. Details on that front haven’t been revealed, but the ceremony’s return to the city alone is a fitting move for the honor. Since its inception in 1984 (at Radio City Music Hall), the VMAs have taken place in the city 16 times, at venues like Madison Square Garden and the Metropolitan Opera House and the Barclays Center. Monday’s ceremony, airing live starting at 9 p.m., marks the 12th time the VMAs will have taken place at Radio City. See who's performing at the VMAs The VMAs bring your favorite performers to Radio City Music Hall.